Item # 317051 Stash Points: 595 (?) This is the number of points you get in The Zumiez Stash for purchasing this item. Stash points are redeemable for exclusive rewards only available to Zumiez Stash members. To redeem your points check out the rewards catalog on thestash.zumiez.com. Rep the sushi gang while freshening up your space with the Sushi Bed Air Freshener from Stickie Bandits. 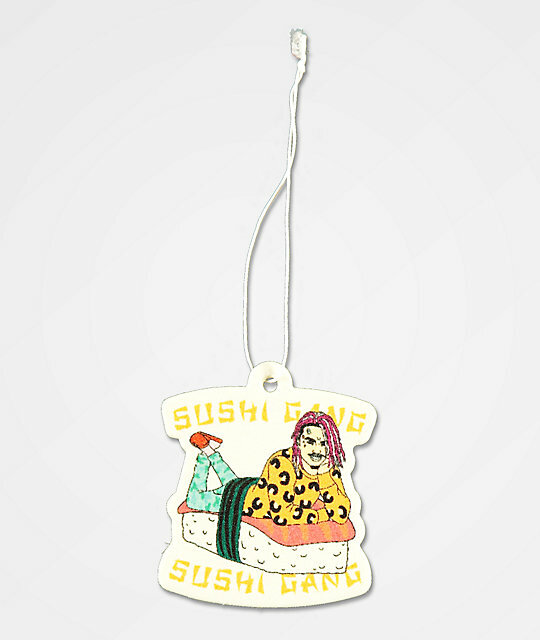 This double sided air freshener features a graphic of your favorite rapper laying upon a bed of sushi, along with text that reads "sushi gang." A fresh scent is added, creating a fun accessory that will instantly uplift your mood. Sushi Bed Air Freshener from Stickie Bandits. 3" x 2.5" &vert; 8 cm x 7cm.